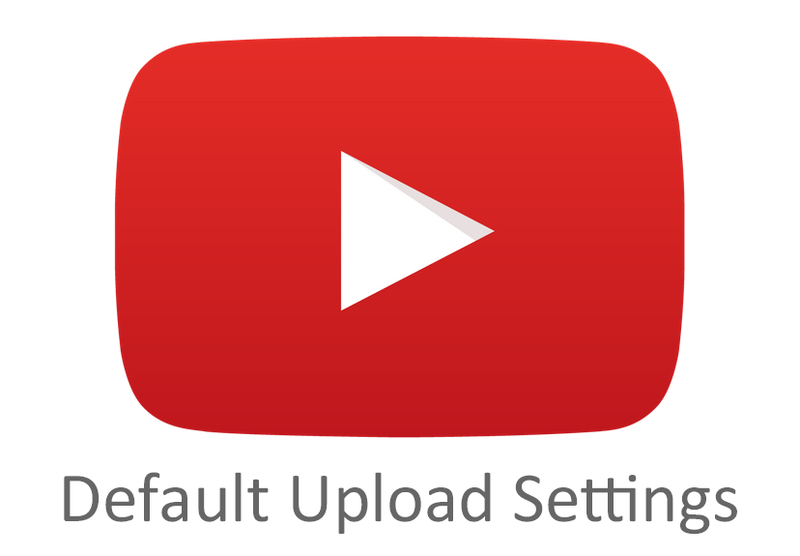 Did you know that you can set defaults for future uploads in YouTube? This can help to ensure that you have your preferred settings for Privacy, Categories, Comments and more for each upload. 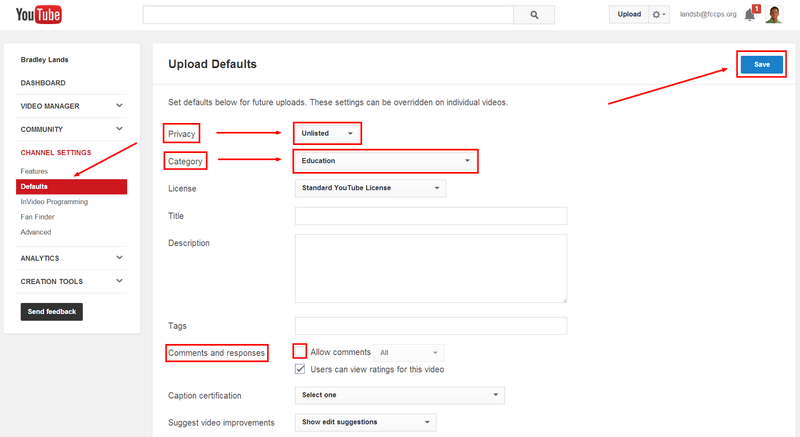 There are actually two ways to adjust your default settings in YouTube. The first way is to sign into your YouTube account and you should see a blue banner across the top of your page that displays the message, "Did you know you can set defaults for future uploads?". If you see this banner, simply click on the button at the right that reads, "Configure defaults" (see image below). You can also change your privacy settings for each individual upload before you select your files to upload by simply clicking on the Privacy Setting button under the "Select files to upload" message. The second way to adjust your default settings is to click on the gear icon next to the upload button at the top right corner of your YouTube account. This is where you will select YouTube settings. Next, you will be directed to the Overview page. At the bottom left, under Additional features, select the View additional features button (see image below). Now, on the left sidebar under Channel Settings, select the Defaults tab. When you select Defaults, you will be able to change your Upload Defaults settings. Some settings that you might want to change are Privacy, Category, and Comments and responses. As a teacher, I would encourage students to change their Privacy default upload settings to either Unlisted, or Private. This will keep their videos hidden until they are ready to change them to be Public. For example, some students might want to edit their videos before they choose to publish them on the web. Or, some students might not feel comfortable sharing their videos publicly, which is perfectly fine. Students can still choose to share their videos with their classmates and teachers inside of their Google Apps for Education (GAFE) account even if they have their Privacy settings set to either Unlisted, or Private. I would also recommend changing the default Category to Education. Most videos that students create in their GAFE YouTube accounts are more than likely for educational purposes. Therefore, this default setting naturally makes sense. However, a student can still choose to change the Category for any video after it has been created or uploaded in his or her YouTube account. The last recommendation I would make is to UNCHECK the box that reads, "Allow comments" under the Comments and responses category. Unfortunately, some students (and even some adults) can be cruel on YouTube by leaving inappropriate comments on YouTube videos. If this box is unchecked, then (by default) others will not be able to make comments on videos. On the other hand, I do recommend keeping the second box checked so that Users can view ratings for this video and other videos. This allows users to be able to rate videos, which is a lot safer than allowing open-ended comments. Instead of changing your settings for EVERY video that you or your students upload to YouTube, consider changing your default upload settings to save time and energy. 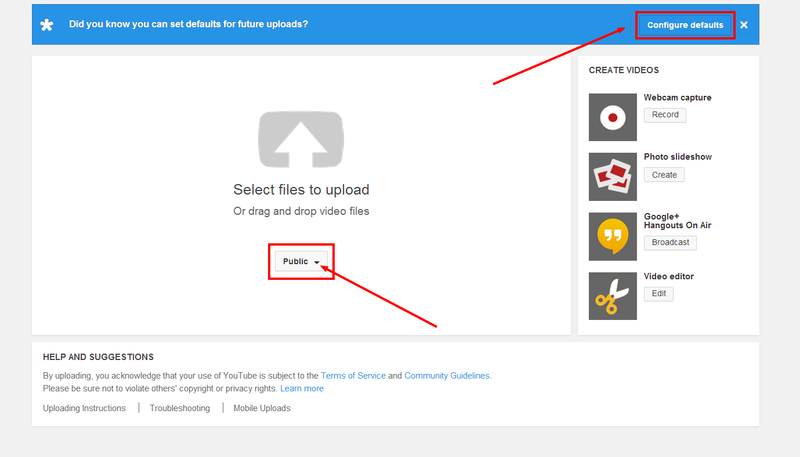 What might you change in your default upload settings in your GAFE YouTube Account? What might you encourage your students to change in their default upload settings in their GAFE YouTube Account? What other YouTube settings recommendations would you give to other educators and students?